Gemini sun natives are friendly, clever, talkative, versatile, curious, perceptive, intuitive, and logical. At times they can also be quite contradictory, restless, two-faced, critical, and impatient. Gemini people enjoy and need work that includes a great deal of variety. They love to do several things all at the same time, sometimes making them late for appointments. They abhor boredom. Gemini natives tend to flit from one experience to another, gathering in all types of information along the way, but seldom getting to the depth of any subject. They go broad and not deep. Persistence is not their strong suit. Gaining knowledge and disseminating it is their real talent. Hence, they make wonderful salespeople or teachers if they stick around long enough to get all the facts instead of only half the story. Even if they do not possess all the facts, since they are never at a loss for words, they will continue with their story as if they did have all the facts. It is important for a Gemini natives to seek intellectual satisfaction. Mental stagnation turns them off, so they read extensively and communicate widely in order to satisfy this longing for mental stimulation. This discontent can make them either very ambitious, or it can incline them to jump from one thing to another, searching for the greener grass which never appears. Gemini natives usually think quickly on their feet and have the ability to use the right words in any situation. They possess tremendous wit and a good sense of humor. Other people may have difficulty in keeping up with their rapid change of subjects. Because Gemini natives think so quickly, they often finish other people’s sentences for them. This can be most frustrating for the person trying to express their own thoughts. There is a need to learn how to control the tongue and allow slower people to express their own opinions and ideas. Since Gemini natives have the capacity to see both sides of any issue, they may fluctuate back and forth between opposing viewpoints. They will usually tend to side with the opinion of whomever they happen to be with at the moment. Then they change as the circumstances change. Indecisiveness is a problem for Gemini natives. Gemini natives are usually emotionally detached. They use their minds rather than their hearts to find their way through things. Logic and reason are their guidelines. They are able to understand what makes other people behave as they do, but they have difficulty in projecting themselves into the emotional reactions of the person involved. Some of the negative traits that Gemini natives possess are lack of concentration and focus, undependability, fickleness, indecisiveness, superficiality, wishful thinking, and dreaminess. They can also be pretty good at nagging. If you have the Moon in Gemini, you tend to intellectualize your feelings. Your moods come through your words. At times you are totally unaware of your own or other people’ deeper feelings and emotional needs. You talk out your feelings and moods. Your primary need is to communicate and to share knowledge. You tend to avoid heavy, emotional relationships and involvements because their is some tendency to superficiality. Commitment scares you. You require plenty of mental stimulation and you feel closest to people with whom you can share thoughts and mental interests. You get turned on sexually through the mental side of things. You have a versatile and receptive mind with a great desire for knowledge. You can be charming, witty and warm-hearted. Nervous tension, anxiety, and stress may be a problem for you. You probably dislike arguments and have a tendency to talk too much. You may tell people what they want to hear rather than the truth. Mental control should be developed or else indecisiveness and constant changing of your mind will become a way of life for you. People with Gemini rising tend to be friendly, communicative, flexible, indecisive, unsure, liking to do two or more things at once, witty, clever, very active mentally, high-strung, temperamental, nervous or anxious, talkative, superficial, and always ready for something different. 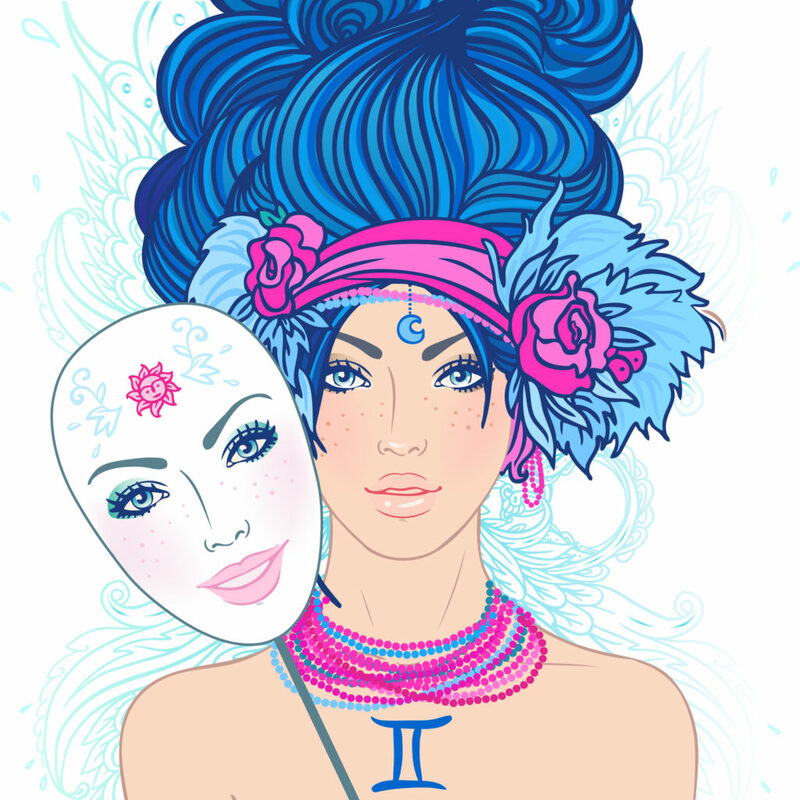 There may be two distinct sides to you as Gemini represents the Twins. You have a strong need to communicate what you already know and to learn more. You enjoy reading and traveling as they both give plenty of scope for picking up new knowledge. You need variety and can be the jack of all trades and the master of none. You tend to go wide – for breadth, not depth. You may appear confident, but you can lack self-confidence and inner sureness. You love to talk, both with your mouth as well as your hands. Spiritual lesson to learn: Control (learn to control and not scatter energies and to prioritize). Mercury rules Gemini so Mercury will be important in your chart.